I was holding out for teachers with a rigorous, questioning and deeply intelligent approach to anatomy, and I found them at Yin Therapy’s Yin Yoga & Anatomy Teacher Training. I’ve had a serious home yoga practice for over 8 years and I’ve been working at The Yoga Lunchbox for almost as long. Over that time, I’ve been exposed to a wide range of Yoga Teacher Training programmes. 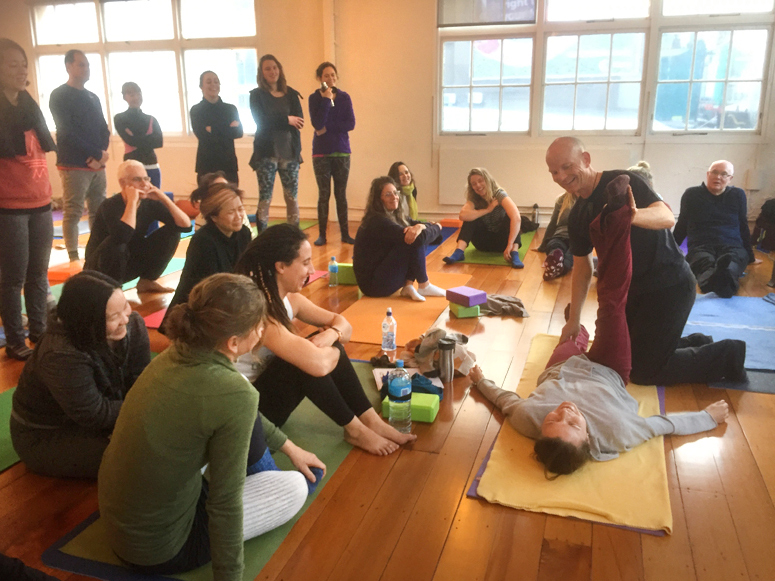 I’ve interviewed many of the teachers behind the programmes, promoted their trainings on social media, and created Guides to help potential yogis find the perfect Yoga Teacher Training for them in NZ and Australia. 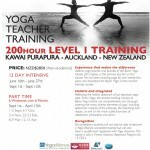 I know what’s out there when it comes to NZ Yoga Teacher Trainings. In fact, I know exactly what’s on offer. And yet, until recently I had never found a training that felt right for me. Why? There was a constellation of deciding factors for me, including location, class size, pricing and teaching style. But more than anything I was holding out for teachers with a rigorous, questioning and deeply intelligent approach to anatomy. Why anatomy? Because it’s something I find difficult to learn from books or through my home yoga practice. Plus I have a growing list of yoga injuries, which often occurred under the guidance or instructions of yoga teachers. That made me suspicious that many yoga teachers don’t receive particularly in-depth or up-to-date anatomy training. I didn’t just want to learn the names of all the muscle groups. I didn’t want to be told to do something ‘Because Iyengar (or any other teacher) said so’. I wanted to know how things work and why and how that shows up in my body on the yoga mat. I wanted teachers who were willing to go beyond yoga dogma and tradition to ask intelligent questions about the human body, incorporating the latest scientific research. It was for these reasons that I chose to complete Level 1 of Yin Therapy’s 200 Hour Yin Yoga & Anatomy Teacher Training. It wasn’t an immediately obvious choice for me because, I’ll be honest, I had never practiced Yin Yoga before. I knew what it was, more or less, but had never felt compelled to incorporate it into my own yoga practice. This was all music to my ears. Even better, the location and timing worked out perfectly. Yin Therapy split their 200 Hour training into four 50 hour modules. This was ideal for me, as I wasn’t in a position to devote a whole month to Yoga Teacher Training, but a week was eminently doable. So, did I find what I was looking for? The holy grail of a rigorous and up-to-date anatomical education? Surprisingly, one of the aspects that I most appreciated about the Level 1 training had nothing to do with anatomy. While there are some things that I knew I wanted from a Yoga Teacher Training, there were others that I didn’t realise I wanted until I experienced them. On that first day with Karin and Markus, the team behind Yin Therapy, I quickly noticed the sophistication of their teaching methods. It was a pleasure to be immersed in a learning environment that had been created with such care. The week-long training was packed full of content, but I rarely felt fatigued or overwhelmed. The lectures were absorbing and engaging, the morning Yin practices were both restorative and deeply educational, and the practical ‘tests’ we conducted on ourselves and our classmates helped to illuminate the theories we were learning. Every moment felt like it had been carefully planned, and had a clear intention behind it. As a student, this meant that I could completely relax into the act of learning. I felt safe, respected and held. I hadn’t realised how much I valued this kind of teaching style until I experienced it. The anatomy content in the course was exactly what I was looking for: practical, non-dogmatic, and engaged with the latest scientific research. Much of it was surprising to me, and to the other students present, many of them yoga teachers themselves. I learnt about how bone compression affects our ability to get into yoga poses, that it’s not always good to ‘go deeper’ in a pose and how incredibly unique every human body is. I left with a deep appreciation for the complexity and mystery of the body, an understanding of some basic structures and mechanics and, most importantly, the invitation to explore the teachings in my own body and yoga practice with curiosity and critical thinking. I’d recommend this training to yogis of all kinds: teachers, aspiring teachers or, like me, students that want to deepen their own practice. Yin Yoga is the perfect antidote to our increasingly hectic and fast-paced (and thus very yang) modern lives. In the quiet and stillness of the Yin Yoga asana practice, I re-discovered my connection to the infinite peace and wisdom of my body. Over the week-long training, my mind quietened (in spite of all the new information I was taking in) and my body softened and relaxed in a way that I hadn’t experienced before. Whether you’re a Yin Yogi or not, (I certainly wasn’t! Although I am now a convert) the anatomy content of this training is outstanding and applicable to all styles of yoga and mindful movement. 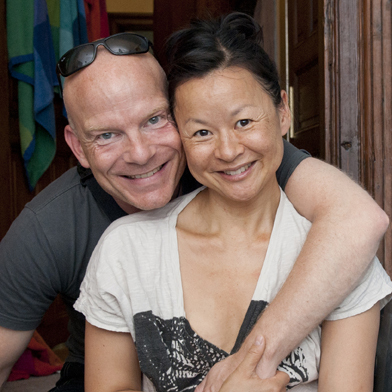 Yin Therapy co-founders and international yoga teachers Markus Henning Giess and Karin Michelle Sang are certified yoga teachers from Power Yoga founder Bryan Kest and their Yin Yoga teachers and mentors Paul & Suzee Grilley, with whom Markus also assists on their trainings. Markus has also completed an intensive teacher training with Insight Yoga founder Sarah Powers while Karin is a certified Restorative Yoga teacher having trained with Karla Brodie and Neal Ghoshal. Originally, professional dancers, they combine their extensive experience in dance, performance, teaching, bodywork, traditional Thai massage, Reiki, meditation and yoga to offer teacher training courses and workshops with a holistic and therapeutic approach combined with practical, hands-on, experiential learning. Markus and Karin currently offer their Yoga Alliance recognised 200hr Yin Yoga & Anatomy Teacher Training course, workshops and retreats throughout Germany, in Switzerland, Austria, Australia and New Zealand. For Yin Therapy’s complete upcoming teaching schedule and more detailed information about the course syllabus, investment, location etc. Nice article. It can be tough to find the right teacher training program since there are so many out there. You definitely want to understand the theory and reasoning behind the training. Sounds like you picked a good one.